All you need is a hot shoe, $50, and 3 AAA batteries to shed new light on your macro photography. 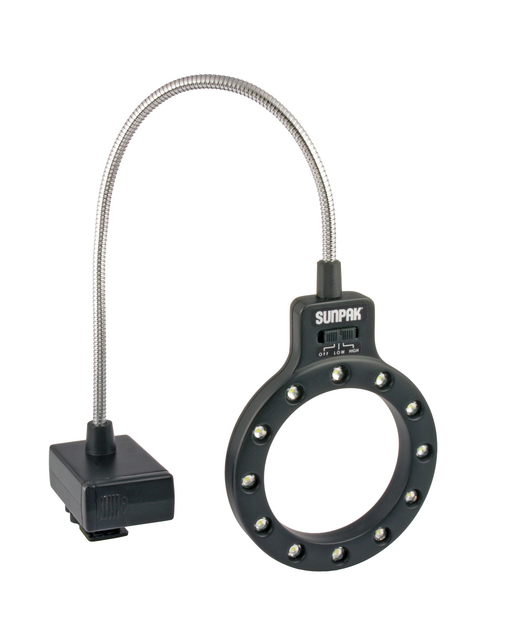 The Sunpak LED Macro Ring Light slides into any hot shoe and fits lenses up to 67mm filter size diameter. The 12 LEDs are daylight balanced and are bright enough to illuminate subjects up to 2' away. The three-position switch offers settings for off, low, and high. The flexible arm makes it easy to position the light around the lens, or from an off-axis angle if your prefer. Weighing in at just a few ounces, this accessory packs easily and can make close-up photography on the go a real breeze. Interesting, did you try them already? I have not tried it, but it seems pretty straight forward. This led ring is very nice I have not seen this kind of ring before this post it is really a very nice one for us. Love the price but wish it were powerful enough to light a person say 6-10 feet away. Anyone know of such a ringhlight/ringflash for $50?